Perspective paper resulting from Joint YESS-YHS ECR Workshop on on major challenges and opportunities in the study, understanding, and provision of regional information for Climate, Weather and Hydrological (CWH) extreme events published! 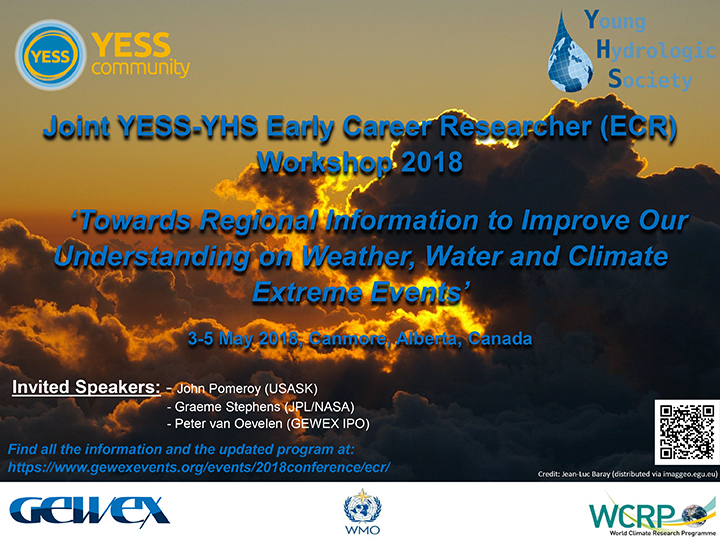 The Young Earth System Scientists (YESS) and Young Hydrologic Society (YHS) held a Joint YESS-YHS Early Career Researcher (ECR) Workshop prior to the 2018 GEWEX Open Science Conference. The objective of the 3-day workshop was to bring together early career researchers and students to have an in-depth interdisciplinary discussion about enhancing the generation of usable regional information on different spatial and temporal scales, and the utility of that information by users, decision makers, and other stakeholders. In this sense, a special emphasis was made on how weather, water, and climate extreme events change and how new data sources and modeling approaches can advance our understanding (and management). The workshop will further serve to evaluate what the early career communities have achieved in recent years, how they can enhance their interaction, and foster collaborations with other early career networks. This workshop was jointly organized by YESS and YHS and is kindly supported by WMO, WCRP, and GEWEX. The workshop received many applications and around 40 participants from 23 different countries were selected. The selection process was run jointly by GEWEX Science Conference organizers, YESS and YHS representatives, and WMO program representatives. The selection criteria accounted for gender, geography, scientific background, and merit. WMO and GEWEX kindly made travel support available for a selected group of workshop participants. Please find more information about the workshop and the workshop agenda here.